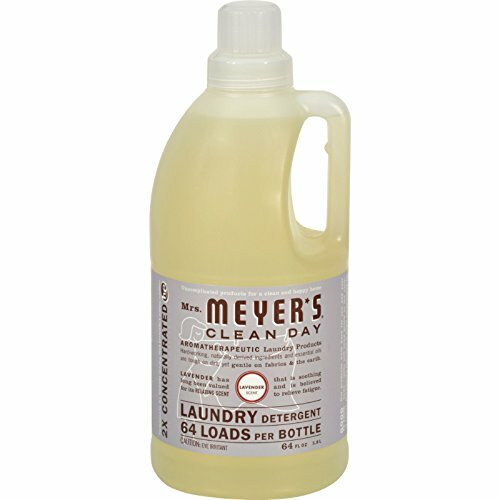 Mrs. Meyer's Clean Day Lavender Laundry Detergent liquid is one of our hardest working cleaners. It is concentrated, safe and gentle on clothes-yet it really packs a punch when it comes to removing dirt and grime. Contains Anionic Surfactants from plant-derived sources, Cotton Extract, Borax, dirt and stain-fighting enzymes, and of course, those important natural essential oils for a garden-fresh fragrance. Formulated for all washers including high-efficiency washing machines. Begin your laundry day by sorting clothes and linens. Check for stains and items left in pockets (candy wrappers, lunch tickets, coins, etc.). Next, select the right water temperature. Use HOT water for whites, colorfast pastels and light prints. Use WARM water for permanent press clothes and jeans. COLD water works best for bright colors and fabrics that tend to fade. Then add Laundry Detergent: 1/2 capful for an ordinary load, 3/4 capful for an extra-large or particularly filthy load of clothing. So easy! The formula is made from 97% naturally derived ingredients like orange peel oil and lavender oil.